The Hellios sprayer launched in 2009 is being replaced by the Hellios II. The main assets of the Hellios I have been taken over: - Light weight - Ease of use - Versatility - fuel efficient 140 HP engine With an enhanced chassis and suspension for increased ergonomics, 2 lines to chose from, booms from 24 to 38 m width, the Hellios II is a strong and relaible spraying solution on small to mid size farms! 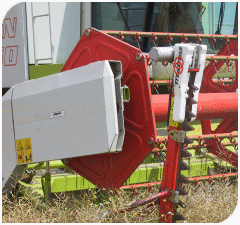 The spryaer has been introduced to the market at Innov Agri in 2014. New optional lighting system available for the Xénon sprayers! The Xénon Pro and Expert line of sprayers can now be optionally featured with the LED-MASTER lighting system. The LED MASTER 1 provides consistent lighting of the spray jets. 4 Blue LED’S will ensure perfect visibility on the complete boom width when spraying at night. The LED-MASTER 2 consists of several LED’S positioned above the frame and on the boom. These powerful work lights ensure perfect visibility on the field ahead. To ease the maneuvering, the rear wheels are also illuminated. The BoomFlex, a new standard equipment for the Xénon Pros and Experts ! From now on all Xénon Pros and Experts will feature the BoomFlex system as a standard. 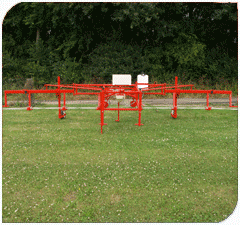 The BoomFlex consists of two double action hydraulic cylinders which are fitted to the front frame and which damp the boom whipping effect when braking/accelerating the sprayer. This is a real plus to ensure consistent and constant spraying quality (fewer risks of application of too much or too little mixture). 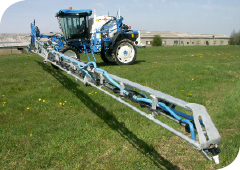 The BoomFlex furthermore reduces the mechanical stress to on the boom and sprayer. Matrot’s rapeseed cutter bar : Compatible with all harvesting machines! The DC 135 rapeseed cutter bar is very simple to use and highly efficient. The DC 135 can be fitted on all harvesters and features 2 mobile blades. It operates with either 12 or 24 V and is very easy to install. 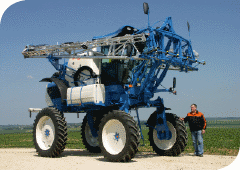 Mobil Cord : Plan on your forthcoming Herbicide applications! The pre harvesting season is right ahead. Don’t forget to supply you with Matrot’s Mobile Cord, the proven tool to efficiently prevent beet weeds, bolters, etc. Click here to know more about the Mobil Cord. Discover the new Activ Geo option for Xénon Expert: sensor controlled boom height adjustment! Get in touch with your Matrot salesrep for further information. Already have a Trimble Autoguidance device and willing to use it on your Matrot sprayer? 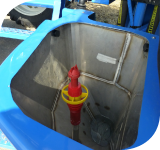 Choose the pre equipment to easily integrate the Trimble Autoguidance device on your sprayer. Optimum operational safety for the driver: Matrot Equipements are the first French manufacturer of self-propelled sprayers featuring Category 4 rated cabs as a standard on their Hellios and Xénon sprayers! Optimum air quality is granted at all times through a triple air filtration, slight overpressure in the cab and constant air renewal. The cabin pressurization will automatically start as soon as the cabin door is closed. Inducing powdery substances or liquids has never been this easy with the Xénon Pros and Experts! The newly developed mixing hopper available exclusively on the Xénon Pros and Experts features a vibrating device allowing fast and hassle free powder induction. No more deposits on the bottom of the mixing hopper. The ergonomic and extra-large mixing bowl allows easy canister positioning and safe induction of liquids. Click here to know more in regards to this innovative feature. Two new versions for the Xenon and Hellios sprayers ! The self-propelled sprayer Xenon from Matrot is now available on two versions: the Xenon Expert and the Xenon Pro. Second change on the range : the Hellios now exists with booms up to 36/38 meters. PPI Mixture circulation for precise and instantaneous pressure ! Matrot launched a new mixture circulation system. The Hellios, Maestria and Xénon sprayers can now be featured with MATROT’s latest innovation: The PPI Mixture circulation system allowing a continuous mixture circulation. During spraying operations the mixture is prevented from reflowing towards the main tank which minimizes residual mixture volumes. The system also allows precise and instantaneous spraying application as each section is controlled via a pneumatic solenoid valve. The boom is also kept under pressure while driving on the street, this will allow you to spray at the right pressure from the very first meter. Click here to know more in regards to the PPI mixture circulation. Growing tobacco, sunflowers, corn or rapeseed ? The Hellios can now be featured with a 1,60 m axle for enhanced ground clearance. Minimize the impact of your sprayer on your crops and increase the quality of your treatment.